Kristy-Lee Audette has dedicated her life to music and music education. Originally from Montreal, Quebec, her first musical training was as a ballet dancer with acclaimed teacher and author Miranda Esmonde-White formerly of the National Ballet. Her family relocated to Calgary, Alberta in 1997, where she started playing trumpet in the school band. 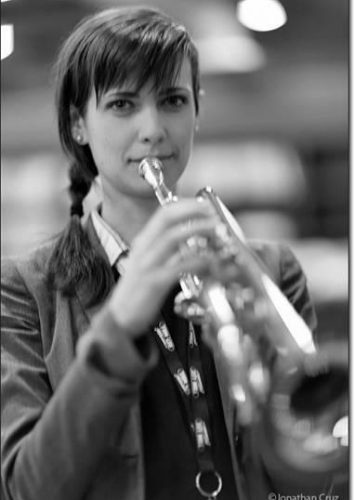 She gladly and graciously took on the role of section leader throughout her schooling, and was asked to mentor a younger trumpet student in her senior year, which ultimately led to the decision to study music education at the University of Lethbridge. Kristy-Lee earned a Bachelor of Music degee in trumpet from the University of Lethbridge under the tutelage of Trudi Mason, and it’s smaller campus allowed for a lot of playing opportunities. Here she was able to perform in the University trumpet ensemble, brass choir, brass quartet, jazz band, wind ensemble, pit orchestras for various operas and musicals, and the Lethbridge Symphony. She was also a leader in the University of Lethbridge Global Drums ensemble, which involved the study and performance of Trinidadian steel pan, African drumming and dancing, Japanese taiko, Brazilian samba, and Classical percussion under the direction of Adam Mason. Wishing to continue her music studies, Kristy-Lee moved to Vancouver and enrolled in the Capilano University Jazz Studies program for trumpet, where she was able to study under the direction of Brad Turner, and studied composition with John Korsrud. This was also the time she began teaching private trumpet lessons at Tom Lee Music, and then also eventually out of her own studio. In 2012 she began teaching music full time, filling out her week at Deep Cove Music, where in addition to trumpet, she teaches beginner piano, guitar, and ukulele. As a performer, Kristy-Lee stays busy as a session musician in various capacities. She records trumpet regularly for many different artists in Vancouver, has had the opportunity to work in a lot of the beautiful studios all over the city, and at 604 Records contributed her trumpet playing to the works of artists like Carly Rae Jepsen, Mariana’s Trench, Coleman Hell, and Steve Bays. As a live performer Kristy-Lee has toured internationally and played trumpet for dozens of groups all over the country, most notably for Sloan and Adele, she also performs regularly on guitar and synthesizer, and is no stranger in the wedding band circuit.